This is Vittoria Wharf, on Fish Island, opposite the Olympic Park. It's a former Victorian warehouse, until recently used as artists studios. It's being demolished. It's being demolished so that a new footbridge can be built. This new footbridge will replace an existing footbridge a couple of hundred metres upriver. The existing footbridge is less than four years old. The existing footbridge is to be replaced by a road bridge. It seems the London Legacy Company aren't particularly good at forward planning. The new road bridge is needed to service the new neighbourhood of Sweetwater. 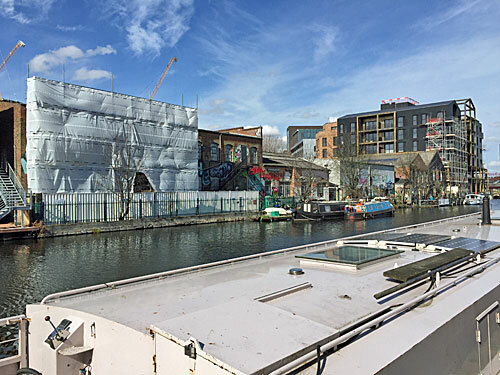 Sweetwater is being squeezed into the space between the Olympic Stadium and The River Lea, south of the Overground and to the north of Old Ford Lock. All the land where Sweetwater will arise is now sealed off behind hoardings. A heck of a lot of new hoardings are going up at the moment. 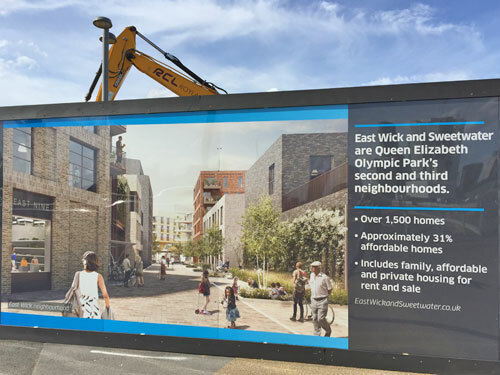 This hoarding shows what the neighbourhood of East Wick will look like. East Wick will be squeezed into the space between the Olympic Park and The River Lea, north of the Overground and opposite to Hackney Wick. East Wick will have the same generic brick flats that everywhere else in London is getting. If this artist's impression is correct, its main shop will sell jumpers and handbags. 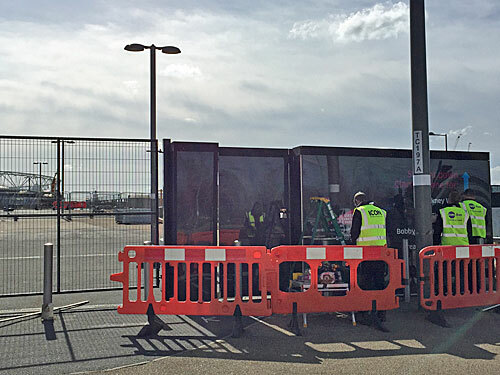 Workmen have been busy this month sealing off a long, thin section of the walkway across the centre of the Olympic Park, between the Copper Box and what will eventually be Sweetwater. This is so that a brand new road can be built, leading south from the Copper Box towards the western side of the stadium. Once that's finished, the existing Loop Road which runs closer to the river will be closed, and then built over. More riverside flats means more money for the developers, I guess. The existing road curving down from the Copper Box to Carpenters Road will also be permanently closed. All traffic heading south will take the new route into Sweetwater, where another new link will be opened to the new road bridge that's currently a footbridge. This will allow vehicles to flow onto Fish Island. Here's more about the bridges, here's a map of the final layout, here's a map of the enabling works taking place over the next twelve months, and here's where more information will eventually appear. Next time you walk between the south of the Olympic Park and the north, don't expect to see quite so many sweeping open spaces as before. This area was always intended for flats, so that's no surprise. But having transformed the road network hereabouts once for 2012, it does feel like someone's changed their mind since, and here we go again.